Every year since my boys have been very young we have played the Receiving Game. We gather some empty gift bags and hand one to each son. Then we sit in a circle and pick a person around the circle to give a gift. I give everyone a couple of minutes and the boys collect gifts for one another or me from around the house. After that, we sit in a circle again and present our gifts to Mom or one of the brothers. Each person takes the gift from giver and thanks them. THEN, he/I open the gift and find something nice to say about the gift. “This is my favorite color.” or “I love the smell of this candle.” or “I can always use socks! Thanks!” The comment must be positive and accompanied by a genuine smile. Inevitably, a brother thinks it is funny to give underwear and this year was no different. 🙂 It brought many laughs and a good lesson on receiving. Why would we play this game EVERY year? It is important to me that my boys learn to receive gifts given to them around the holidays. It is important that they put the GIVER in front of their own feelings and preferences, even if they get underwear. Never say “I already have this.” (We will exchange it later.) Again, never say this. Never say “I don’t like this color, item, toy, character, etc (Again, we can exchange it if needed.) Find something you DO like about the gift and say that. Remember the Giver is the most important one in this transaction. Each year we write a paper, handwritten Thank You for our gifts as well. Yes, it takes time. Yes, it can be a pain for Mom. No, the boys don’t love to do it. However, it is so very important that we thank others for their gifts. It is important that we think about the Giver and what they did for us to get presents to us: thinking about us, money, time, purchasing, wrapping, bringing the items. Through this process, we reflect on the Giver of the most precious gift: the Lord Jesus Christ and our salvation through His blood. He, a sinless God, became a sinless man to die on the cross for us. We deserve death for what we do wrong every day (I might be speaking for myself only here…) But, His blood was shed and Jesus Christ gave up His life for us-for me, for you. He paid the price of our sin. Then He was buried and rose again from the dead, conquering death. Praise the Lord! Wishing you a very Merry Christmas and Thankful, happy 2019. Every year we do something out of the ordinary in the world of Halloween and fall. If you celebrate Halloween by dressing up your children and moving them around the neighbor to collect candy, blessings to you. I don’t want to go into a long debate about why we do not do this or why you do. We don’t. My boys dress up every other day but not this one. We are all okay with that so please no “hate mail” about being a Halloween Scrooge. 🙂 Thanks! Instead, we use the day to think about a wonderful event that happened this day to draw the world once again closer to God’s truth. We celebrate Reformation Day on Oct 31. We have been doing this for several years and really enjoy this focused time as a family. We celebrate the coming back to the Truth of God’s word through the man of Martin Luther. While we don’t agree with all his published works, we do appreciate the doctrinal principals that came from his work. The 5 Solas or the five “onlys” of the Reformers’ writings and speeches point us back to the truth in God’s word. On Oct 31, 1517, Martin Luther posted his 95 theses or corrections to the local Catholic church in Wittenburg, Germany. He did this the day before All Saints Day, November 1, when he knew many would attend mass at the church. He did not plan to split the church, but he wanted the church to take a good look at where it was and change its actions to get back in line with God’s word. At our home we spend the evening talking about the truths we find in the Reformation writings. They wrote that we live and learn by “Scripture Alone” apart from traditions of men, personal preferences, or anything else. We are saved by “Faith Alone” apart from works and ourselves. Salvation is by “Grace Alone,” not receiving what we deserve through no work of our own. We have eternal life through Christ’s blood on the cross and not our works which leads to salvation is by “Christ Alone.” (If I may just interject: If God’s blood was not enough to pay for my sins, how could I EVER believe that anything I, a sinner, do possibly be enough? How could I add to the perfect sacrifice or be better than it?) There is no one else we should pray to or through except Christ. Christ is our mediator (I Tim 2:5), our Saviour, our Lord. He is the only way into Heaven. Finally, “Glory to God Alone” is the last Sola. Salvation is from Jesus Christ alone and He alone deserves the glory, no man. We review these ideas, looking into the Bible at scriptures that show these points clearly. As you can see in the pictures, I set the table with the 5 Solas attached to construction paper and a blank sheet for the person who will pray for us. We take turns going around to read the portion of truth and the scriptures that go with it. We have a fun meal and enjoy our time. If you are looking for a resource about Reformation Day or where I found the Solas to print, you can find that free resource here. I encourage you to take a look at what you believe this time of year and why. Teach your children to love God’s word, know His word, love other people and share God’s word with them. It is not love to hold back truth from others. Love your boys. Teach them well. A couple of weeks ago I attended my 25th class reunion. I saw wonderful classmates that I hadn’t seen in years. Some of them I hadn’t seen since high school graduation, some since the 10th reunion I attended, some I saw more regularly. It was fun catching up and hearing about their children, their jobs, their lives. A couple of days ago, one of the members of my class passed away suddenly. It was shocking! I had kept in touch with this friend only on Facebook for years as she lived in another country. My son asked if I knew her well. I quickly answered, “We went to school together from kindergarten to graduation, 13 years together. Yeah, I knew her pretty well.” But do we really ever know when people are going to die? About a year ago, my husband’s grandfather passed away at the age of 89. He had lived a long life and death was long in coming. It doesn’t make it easier, but we understand it better when someone is older and dies. We feel they had a long, complete life. It makes you think when someone suddenly passes away…starts your mind on dying and living or end of life situations. It starts you thinking about your family and your death and life right now. It also starts that natural tendency we have as humans to start “weighing” our lives. You know judging ourselves against the lives of others, our dreams of the past, the non-reality of perfection we try to attain. We start thinking about our losses, our failures, our brokenness, our sin. We don’t need the Bible to tell us that we aren’t good enough. I know this when I huffed at something my husband was doing at lunch today or yelled at a son who wasn’t listening after 142 times of my giving the same directions this morning. I knew I had sinned when I had those thoughts last week about wanting his car, her life, or that house, coveting…We know it! We don’t need scripture to tell us we are sinners. But it does, just in case we are feeling too important or proud or right or self-sacrificing one day. Romans 3:23 is right there to tell us that “All have sinned, and come short of the glory of God.” I am less than perfect, less than Him. Less than His standard. I fail, I sin, I lose. But, this isn’t about me. It is about Him. God Almighty, the maker of Heaven and Earth, the creator of man and woman, the King, the Lord, the only one true God has a standard. We don’t have to like that. We don’t meet that standard (His glory) and I am betting we don’t really like that either. He has a consequence for our failure, sin, pride, hate of Him, and it is death. Death is the wage we earn from our inherited sin from Adam, the first man. “Well, that’s NOT FAIR” you might yell (…or maybe you just think it sometimes.) But we certain earn that wage as well with our daily…okay, sometimes hourly sins. Romans 6:23 tells us, “The wages of sin is death” and it is. We will die. All of us will die one day. Some will die today, some tomorrow, some not for years and years. But, we will all die. We don’t need the Bible to tell us that everyone dies. But it does. Hebrews 9:27 tells us, “…it is appointed unto men once to die, after this the judgment.” It’s going to happen. We just don’t know when. We need to be ready, though, for death. Our own deaths are coming. Death around us makes us realize our own mortality. But it also makes us realize again that we aren’t enough. Weighing, all that weighing of self comes back to us. Have I done enough? Have I done anything good? Oh, yeah, that one thing–that one time when I –well, you know what I am talking about!? 🙂 But, I know in my heart, the answer will always be no. I haven’t done enough, no matter how much I do. Luckily, this doesn’t have to be about me. And, you know what? It isn’t. I WILL NEVER BE ENOUGH. There, I yelled it for the world to hear and read and see. I will never be enough. But, the good news is, God doesn’t ask me to be. He doesn’t ask me to be enough. He knows that I can’t be enough. Instead, He is enough. He came to Earth. He paid the price, the wage for sin, which we know is death. He shed His precious blood so that we could be enough through Him. He died in my place. He took on my sins. He loved me enough. I don’t want to be flippant about Jesus dying on the cross, being buried and raising again. I think sometime people say that or hear it so much that they don’t remember the terribleness or wonderfulness of those statements. Jesus Christ was tortured, beard and fingernails pulled out, beaten, mocked, and left alone. He then suffered one of the worst kinds of death ever–suffication, drowning in your own fluids– through cruxification. God the Father turned His back causing darkness over the whole Earth for 3 hours. The Father could not look at the sin. Jesus was left alone to pay the price for MY sins. Then Jesus gave up the ghost, He died. He left His earthly body. A soldier cut Him open and then left his body hanging on the cross. Jesus was put in a borrowed tomb and left. Three days later, Jesus Christ arose from the dead. He conquered death. He is alive again. We can be alive with Him forever too. Yes, we still have to die a physical death, but friend, we don’t have to have eternal death. We can have eternal life through Jesus Christ and His sacrifice. “For by grace are ye saved through faith; and that not of yourselves: it is a gift of God: Not of works lest any man should boast.” Ephesians 2:8 & 9 says. Don’t brush me off. Don’t push this away. It is real. It is real, Friend. Life will end and we will be judged. No matter how much good you do, sin will keep you from eternal life without Jesus Christ. But, it is FREE! You don’t have to work. You don’t have to DO anything except just believe it. It is a gift. Just take it. You know, I have had people tell me that I had to do A or B or C or 10000D but how would I know that I did it right? Did I do it enough? What if I didn’t do it right? well enough? long enough? exactly right? It wouldn’t be enough. There is NOTHING that I can do. Besides, we don’t work for a gift. This is a gift of God. We don’t understand it. We do not seek Him. We don’t do enough. Trust Him. Believe Him. Know that He is enough. Take the gift. So, it’s really not about me. He died so that I could have eternal life and there is nothing that I can do to get it except just believe that He took care of it. I just take the gift. When I die, I know there will be stories shared and pictures brought out and dusted off to show others. Most likely and friends and family will gather to remember me. I don’t want statements like, “Oh she did… she was…she gave…she whatever.” I want it to be about Him. Christ Jesus died that I might live. He died so that when I die, I will have eternal life. I don’t have a question about “being good enough” because I know the answer is no. I know that I deserve eternal death, hell, eternity away from God. I know it. But it isn’t about me. It isn’t my pride that tells me I have eternal life with God. Because, while the wages of sin is death, the gift of God is eternal life through Jesus Christ my Lord. I have taken it and believed that precious, perfect blood is enough. Will you take it? If your children don’t know the Lord, tell them. Share God’s word and God’s love. They need this just like you and I do. Love your kids, share the truth. Hi, I realized the other day that I am not typing in all the blogs I am writing in my head lately. I have reacted to the political hotbed, the gorilla, the attacks on US soil, the crocodiles and so many other topics. However, I have not been able to get responses completed and produced. Okay, that is only partly true. Really, I also don’t know that I have the ability or the maturity to react to all that is going on around us with enough grace or wisdom to respond lovingly. What I have been thinking about is teaching my boys. Yes, we home educate them and yes we are teaching them skills other than “school” skills like gardening, cooking, and taking care of animals. But, I have been thinking about teaching them what is even more important than that: the Lord. With things as they are and are moving toward, I am not sure how much longer I will be able to teach my children at home. I am not sure how much longer I will be able to openly train them in God’s ways. So, I am feeling a real burden to teach them the things of God NOW. Not waiting. Right now. Yes, I am busy. Yes, I get stressed. Yes, I have a very long to-do list. But, isn’t one of Satan’s greatest tools a “too busy mom?” Think about it. She has to do so much work to keep her family moving in the right direction and then has outside pressures. She is busy, busy, busy. Sometimes she is just keeping up with the neighbor getting her son into another sport. Sometimes she is keeping up with a Facebook friend and adding a new item to her menu or exercise plan or reading list. Sometimes she is keeping up with Pinterest and adding new decorations to her home. Sometimes though it is just the laundry, dishes, and life of living with a family that keeps us so busy. None of these things are bad. They are just busy. This past school year we started going through a study from Not Consumed that is called Foundations of Faith. Find the link to the study here if you like. (I am not getting anything from your buying this item should you choose to do so.) It doesn’t give a lot of doctrine but it asks a lot of questions. It starts with ones like “Who is God?” and “Why am I here?” The author lists some verses you might want to check out and then there is space to add in lots of the verses you find yourself. She also brings up judging and discernment and how they are different. She moves on later in the study to matters of “What we Believe,” and purity, dress, media, alcohol, and money as well as other topics come up here. She doesn’t tell you what to teach your children. She just asks about what your family believes and gives you questions to think about and discuss with your children. This opens the door to talk to your children about your family’s beliefs from scripture. My favorite part is that it forces me to think about what my husband and I believe (Sometimes I even have to ask him!) and to see if those are Biblical beliefs or just a tradition that we grew up with in our homes. Do you know what you believe about modesty, media, marriage, or money? Do your children know what you believe? Do you know why you believe those things? Do you know what scripture says about those topics and do your children? This is a wonderful study about the things that really matter. In a world where so many people are telling us what to believe and why, our children should know what we believe as Godly parents who are seeking the TRUTH and where we find that in scripture. So, what do you do if you begin to study scripture and what you believe (or thought you believed) doesn’t line up with the Word of God? Well, this is where the toilet meets the floor. You know–that wet dirty ring around the bottom of your toilet? Come on, you know what I am talking about! I can just see some of you looking away like I can actually see you. Others are now thinking about the last time they gave that area a swipe with a disinfectant. If you have boys, that ring is often yellow and smelly! That is the gross place where reality lives. Stay with me here. (Okay, if you must go and clean, do so. I’ll wait for you. ) You have to get in the Word and find out if your thoughts, your beliefs, your reality is really God’s. If it isn’t, well, you’ll have to decide what to do then yourself. Do you really want to go against God? My suggestion is that when we find those things that don’t line up, that WE CHANGE (gasp!). Yes, we move our thinking to align with God’s. And, if you don’t know where you stand on some of these topics, it might be a time to study a bit more yourself or with your spouse. If you don’t know what you believe, how will your children know? They are going to get their belief systems, ideas, morals, and reality from somewhere. Adults, media, friends, and teachers are all too happy to share their ideas, but your children need the Word of God. They need a sure grounding in the one place that never changes, that never moves away from what is right and good and pure. God’s Word is that place. 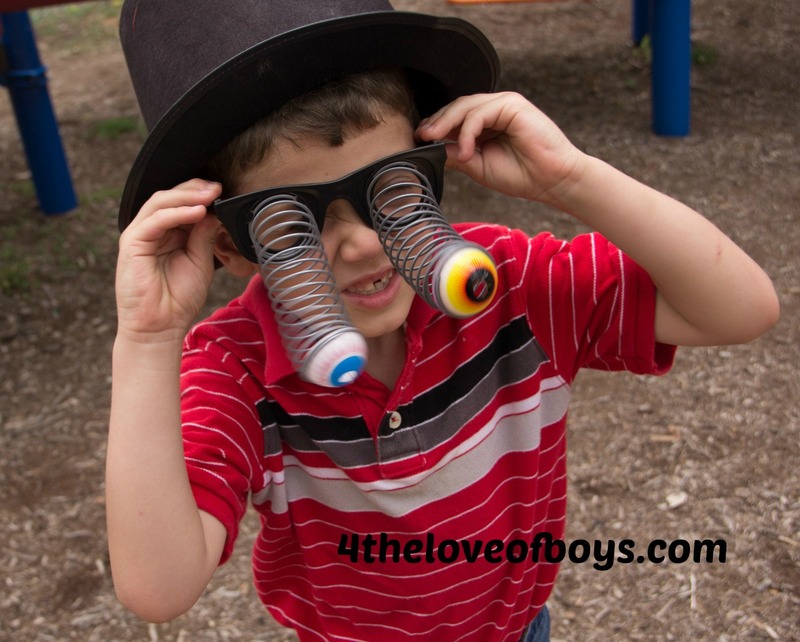 Teach your boys (and all your children!) God’s Word and your belief in it. Someone else will gladly teach them something else, if not. Love your boys and teach them! 2016 is already here! Where is time going? “Slow down, Time!” Each year as time goes by, I have decided not to do a New Year’s resolution. Why? Because I don’t want to fail. I have enough stress, enough struggles, enough loss, and enough pain that I never think about setting another goal which I might not reach. I was driving down the road the other day as the Christian radio announcer spoke out the alarming number: 8%. Of those who set New Year’s resolutions, 8% are able to fulfill them. Really? Really! Why is it that such a small number of people will achieve their goals? I think it comes down to the fact that we are sinners. We sin. We fail. We try to depend on ourselves; we strive for perfection; we try to do it alone, instead of looking to the Lord for strength, hope, love, peace, joy. Those who do not know Christ have no power over sin and failure, loss and then shame. Shame and failure: that may be the real reason that I don’t set New Year’s Resolutions normally. Last year, I just set a goal to be joyful. Yep, you guessed it. I was NOT one of the 8% and felt shame that I did not achieve that “simple” goal. I had given myself no grace and no “half-way.” I either had to be joyful each day or I was a failure. I didn’t even write about my year and what I was reading. I stopped reading the encouraging book. I relied on myself and I failed. I have not set resolutions in the past, because when I did, I knew I would fail. However, the first week of January of 2016, I decided that one who does not set some sort of goal, she will never achieve anything! Maybe I needed to rely on God for the outcome, get over my perfectionist tendencies (at least some), and set a goal to work toward. Thinking about what I would like to achieve, I realized I wanted to be healthier, in better shape, more focused on my boys and the Lord, more learned. In a word, I wanted to move toward perfection. EEK! It sounded like failure just thinking through all those things. But, after some prayer, here is what I have decided. Move more. Again, how can I go wrong, right? 🙂 Yet, I want to be intentional about moving–park and walk to the store, run around with the boys, work out in the evening, move around while teaching or cooking, dance in the kitchen. But, I don’t have to do this daily or a certain number of times each week. I just want to intentionally move more. This month I added to my calendar that this goal might look like “lifting 2 times/week.” Each month I may decide to do a mini goal but maybe not. I have not been able to lift twice this week, and I don’t want the shame of not accomplishing it. I might have to do that before I go to sleep…or I may just give myself grace to do it tomorrow. 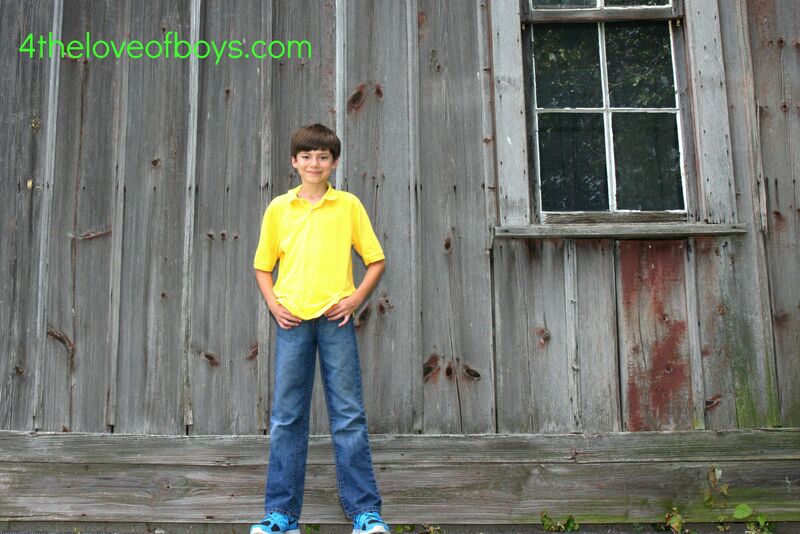 Be intentional about the boys is my last goal. I am learning that it is the little things that matter. I was becoming annoyed that the boys’ clothes were all over their rooms, not in drawers. WHY? After some time I realized that they believed the clothes would not all fit into the drawers. At the change of the seasons, I put all the clothing into the drawers so I knew they all fit. How then is it that after a couple of week the clothes no longer fit?! Parent Realization #309: The boys did not know how to properly fold their clothing so the clothes turned out too wrinkled and “large” to all fit. Each week, I wash the boys’ clothes in separate loads, and they fold their own clothing and put it away in their rooms. 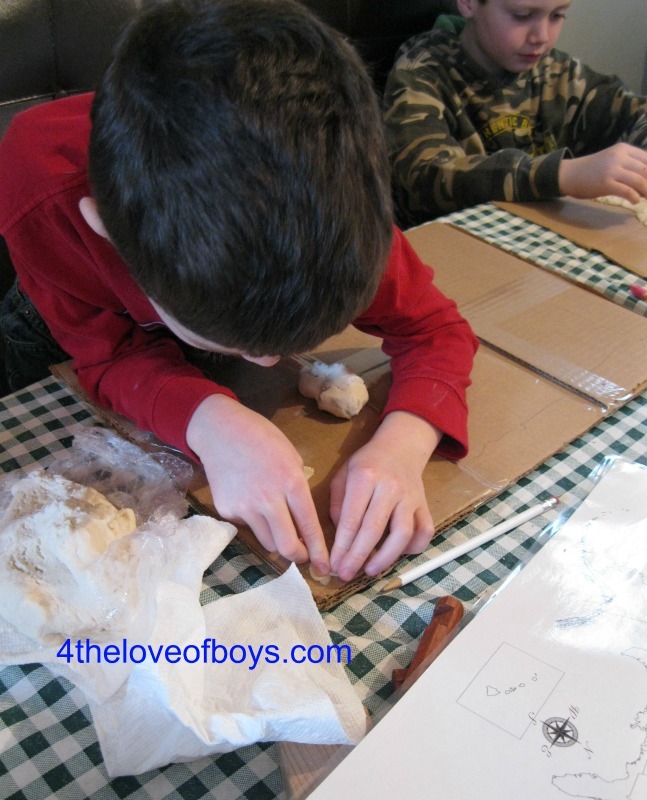 Last week the boys each had their loads, and I went through folding lessons again (ahem). Showing them again how to fold jeans and long sleeved shirts. Paying attention to the details really does make a huge difference. And guess what? All the clothing fit in the drawers! As this month moves into the next and the next, I hope to be flossing, moving, copying, and paying attention to the details of my boys’ lives. But no matter how many goals I am meeting for myself (or not), I pray that I will continue to be leaning heavily on the arms of my Saviour and Lord: Jesus Christ. If I am in His arms, I cannot go wrong. And maybe that was the trouble with the past, the shame and feelings of failure. I wasn’t resting in His arms and His love. I am His child and He loves me just as I love my children, unconditionally (flossed teeth of not). Love your boys. Love your family. It will be what they remember & is a goal worth achieving! So, we are working on American this year in our education: artists, geography, history sentences. We work with a group called Classical Conversations (more about CC another time) and we are working on Cycle 3: American. It is great to have a collective topic to learn and this is our second time through it, so we are adding in more and more background. My boys learn best using kinesthetic methods (a fancy word for hands-on), so I tried to think of some things we could do to help them learn better. I came up with salt dough maps. So, yesterday we made the United States from salt dough. Each boy used a batch for themselves and then a batch split for the mountains. Cowboy made little balls and connected them, but Engineer just made “hot dogs” on top. They decided this time they would not draw the states with a toothpick. I was hoping at least someone would, but I did say that they could do it how they liked: adding states, mountains, rivers, trails, Great Lakes, and other features. We were able to talk about each state as we talked about the placement of the mountains. (Note to Moms: you must draw in the States, if you choose to or add the mountains BEFORE the dough dries unless you want to just paint them.) My Engineer starting by drawing a map & the others soon followed his lead. 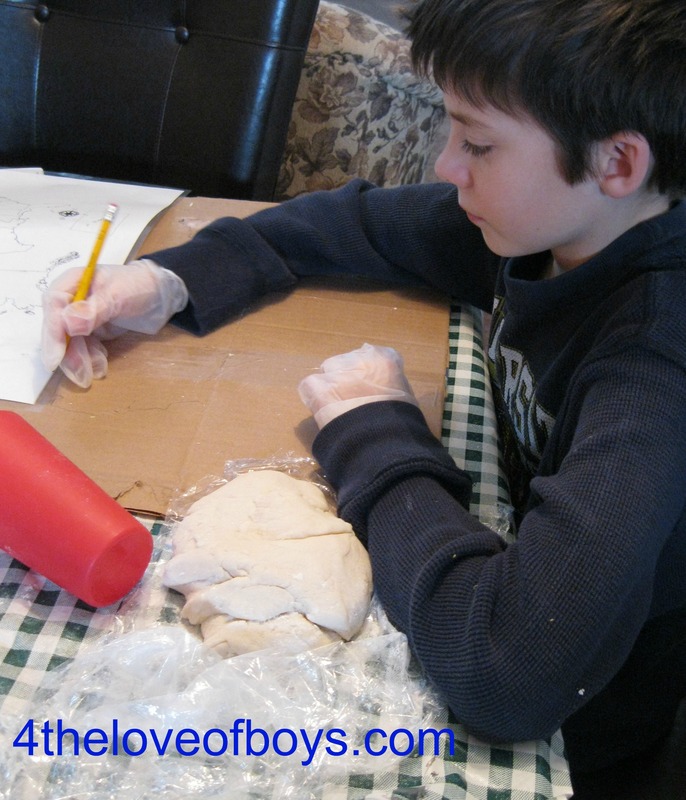 The boys found working adding dough around the edges & then working inward toward the center worked best. Maine was hardest! We will add those features we have not yet covered as we do cover them in class. This has been a good review for us and we will get to review again as we add trails and deserts, prominent features and canals. We will use colors to differentiate locations/features as well as sticking on labels the boys make. Here the Farmer is adding the space between Florida and Texas. I hope all those states will forgive us for recreating their borders! Children learn in different ways. My four boys all seem to like to do things with their hands, so this is one way we can do that. We have a ways to go before these are completed but I thought I would share what we are doing to review and create a more hands-on way to learn. Here the Engineer slowly adds states and the Farmer and Cowboy use toothpicks to get the edges “right.” We also used flat cups for rolling pins. Be sure your dough is not too thin as it will crack apart. 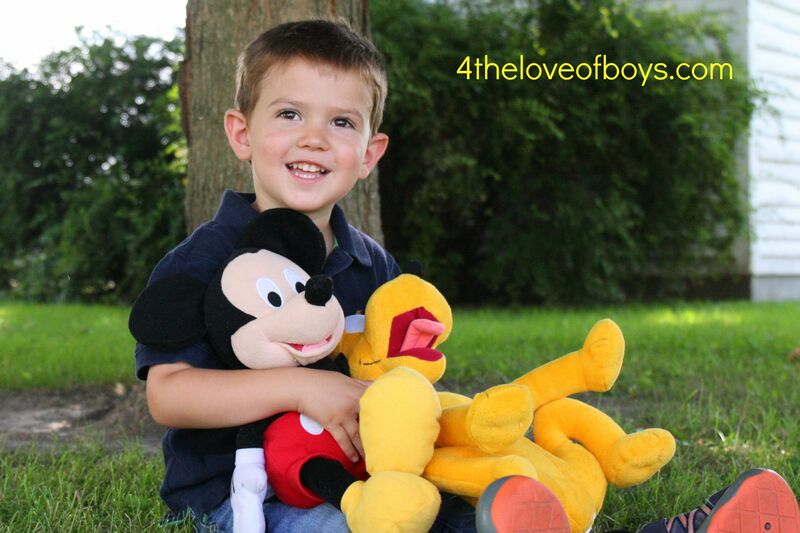 Love Your Boys (no matter how they learn)! Blessings as we all continue to grow. P.S. I know that sometimes we like to do review weeks (other than at the 6 week breaks) so I am adding this to the Halfahundredacrewood link-up page so others might use the idea. Enjoy! In This House We will Giggle: Making Virtues, Love, and Laughter a Daily Part of Your Family Life by Courtney DeFeo. So, what do I want to gain from all this insightful reading? I hope to reduce the STUFF in our home. I would like to rid us of things we do not USE or LOVE.What a concept! Looking around my desk right now, I have items ON MY DESK that I might use, might read, might refer to, might want. You get the picture. I often don’t use, read, refer to or even want the items in the future. Why keep them? Somewhere deep inside I have a strong feeling of warning, that I am guessing came from the generation which lived through the Great Depression: We have to keep THIS because we don’t know if we will be able to get something like it in the future, OR the parts for THIS could be used for something else in the future! Eek! This is a terrible concept to live under because it makes us so owned by our stuff. I am cleaning, organizing, moving, storing, reorganizing…on and on. I doubt that the Lord appreciates things or the time I spend “messing” with them. I want to free myself and my home of these items that we will never miss. Let me be honest here, though. As I was reading through minimalist websites and looking at pictures on Pinterest, I had some realizations. 1. I am NEVER going to have a house that looks like those pictures. 2. I do not want my HOME to look like those pictures. We have a home and not just a house. Many of those pictures appear stark, sterile, and sadly “un-homely.” I want my boys to have a comfortable home and a warm home full of color, fun, crafting, learning, and love. I do not want bare rooms, but I do want less of what we do not really need or want. I desire to have organized and orderly rooms. Everyone thinks more clearly and is more creative here in clutter-free spaces. Since we home school, we also need the order for us to be able to learn and study. Going back to having a home full of color, fun, crafting, learning, and love connects to Ms. DeFeo’s book. I am always looking for ways to add virtues to our home, but mostly, I want to hear more laughter, feel more joy. Lately, I have been smiling more at my boys. It caught one son by such surprise that he actually looked behind himself to see where I was looking. Another day, another son asked “What?” when I smiled at him. This is a sad realization for my Momma heart: they do not see me smile at them enough. So, I have been smiling more and making things a little more fun. I am implementing little ideas from the book, too. I hope to get some joke books at the library and add in more giggles (even some guffaws) to our home. Adding in the fun is so important, but I think I get so stuck on doing life and getting all the boxes checked off my list that I forget to LIVE life. I added joy to our Bible time before school, looking up verses & talking about ways to inject more JOY into our daily lives. I only have a few years (though some days it feels more like centuries!) to be with my boys: loving, living, laughing, and sharing joy. So very soon they will move on and more out, and this Mom does not want to look back on these precious years with regret! January starts the month of focusing on JOY for us, just like the Courtney DeFeo’s book suggests, and this month we will begin to reduce items in our house. A couple of days ago, I went through my closet and removed ten items (Yes 10! Ten things just taking up space that were not really my color or no longer my style.) I want to keep doing this purging. We are going through toy boxes next week. If we don’t use it or love it, it needs a new home. I have no misconceptions that either of these goals are obtainable in only one month, but these are long overdue and we have to start somewhere. I will try to update you from time to time. How about you? Do you have plans for the new year? I would love to hear about what you are working on this year. Remember, no matter what you are doing to Love Your Boys! I want my boys to grow up to be strong men who are loyal and hard-working, honest and kind. We work toward this daily with our training and teaching, as well as our discipline and work. It is not an easy job because we will not know how it turns out for some time now. I want to keep the perspective though.They are still young boys and not yet men. I want them to envision what type of job and responsibilities they will have. Sometimes I talk to them about their wives and future families. I want them to think about and discern the type of wife and mother of their children they hope to marry. I want them to create an imagine of themselves as independent men and caring, loving husbands. Mostly, I want them to see themselves as Men of God, standing for His Word and loving those who need Him. But they are not there yet. Recently we have visited many friends and family as well as local libraries and stores. I have repeatedly heard folks, both men and women, asking other children if they have a boyfriend/girlfriend. I have heard teasing about children “dating” and if they are holding others’ hands or kissing. Mostly the children being asked are embarrassed and giggle. But, each time we talk to children about more adult or mature topics, we are encouraging them toward that end. According to the US Dept of Heath for Adolescent Health, in 2013 there were 26.6 births out of 1000 in the US to teen moms (15-19) and for 1/6th of those, it was NOT their first birth. 89% of those births occurred outside of marriage, according to the notes. On the National Campaign to Prevent Teen and Unplanned Pregnancies website, in 2013 there were over a quarter of a million (274,641) teen births. This is saying nothing of the terminated pregnancies, just births. The site also notes that teen pregnancies have declined in the last decades; however, it still states that a staggering $9.4 was spent in 2013 on childbearing for teens. They also noted that even though the rate is down, 3/10 girls will become pregnant before they is 20 years old. Now, I know that statistics can be arranged to look good and bad as the reporter would like, so I often do not put too much stock into them. When I wanted to know about the US National teen pregnancy rate, I did what all educated folks do today, I googled it! 😉 But joking aside, as you well know, teen pregnancy is something that affects all of us. We don’t need statistics to tell us that it is alive and well all around us. We all know young women who became pregnant before they were ready to be. So, what am I really talking about today? I am talking about the adults in the lives of children speaking life and love and perspective into their lives. Speak respect and truth. I am talking about adults NOT asking a kindergartner if he has not been holding a girl’s hand. I am encouraging parents not to tease fourth graders about not “going with” someone. I am begging parents not to put clothes on a little girl which draws sexual attention to her body. 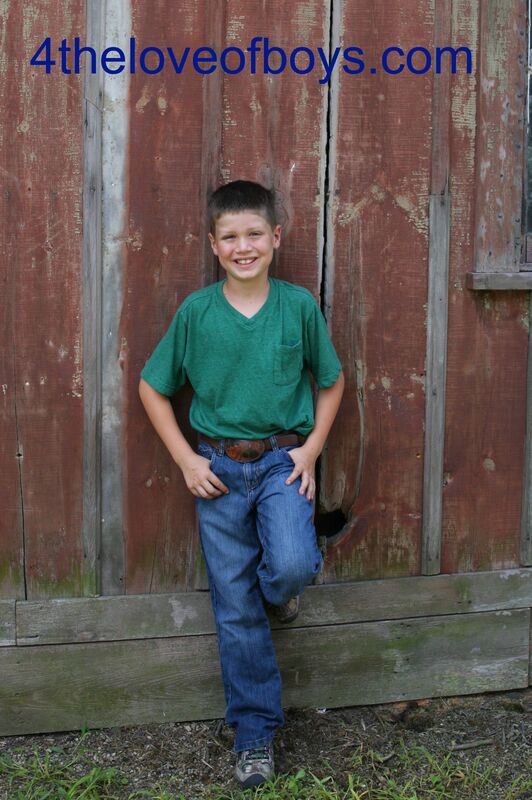 I am praying that family will not laugh at my boys when they don’t have girlfriends in the 8th grade. I am talking about adults allowing children to be children. Recently, I have come across Facebook posts with photos that make me want to say, “Get some perspective! Let them be children!” One was of two first graders, one kissing the other on the cheek while they held hands. The caption said, “First Loves.” Another post was of two tween/teens wearing “I am his” and “I am her” t-shirts. The kids had interlaced arms and big grins. Another still showed little girls going off to school with parental comments noting that their “style” will really draw some (boy) attention. I know that we often joke and tease and think it is cute for children who seem to be doing adult things, but if we encourage our kindergartner to dress like a 25 year old, our first grader to hold hands, our third graders to kiss, our sixth graders to be “claimed” by someone else, how long will it be before they are moving forward to more mature and adult activities: the activities of marriage? Why not let them be children? Why not encourage them to be kind to others and to play and run? Why not encourage them to work their bodies hard and respect themselves? Why not love them and teach them about marriage IN THE FUTURE? If you ask my boys about girlfriends, I hope they will (politely, ahem) tell you that they are not old enough to support a wife.This might sound odd in today’s standards, but I want my boys to think about attachment with intimacy connected to permanence and marriage. I don’t want it to be thrown out when the t-shirt is too small to wear anymore. We, as the adults, are where it starts.Talk to your boys about being good husbands and dads. Share stories of men doing just that. Show them examples and work on skills with them. Build up women as ones to be loved and cherished, protected and honored. Keep intimacy for marriage and forms of pre-intimacy to closer to marriage. The sooner they start on the path, the sooner they will arrive at it. Love your boys! They will one day be men…but not yet! 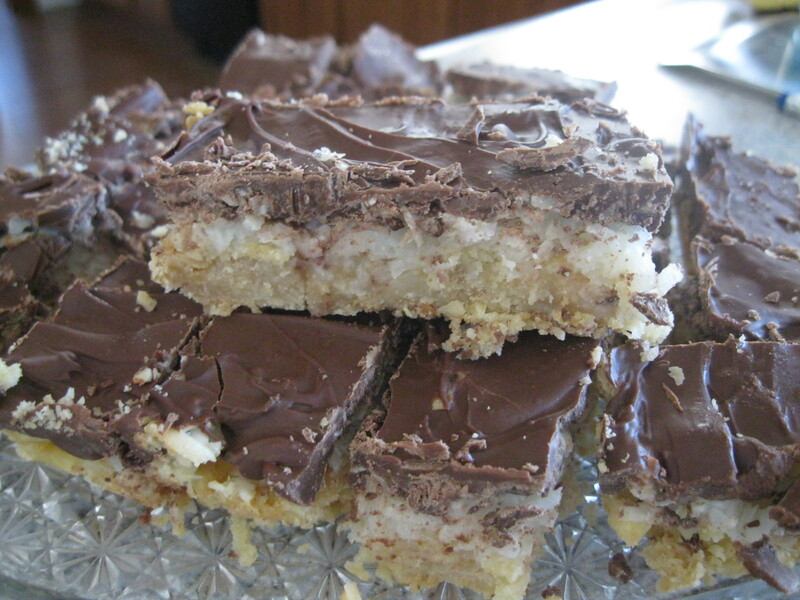 My Mounds Bar Recipe…at last! So, those who know me in “real life” know that I don’t have tons of talents in the kitchen. I don’t bake the perfect pie crust or cook the blue ribbon chili or roast meat or well, anything. I cook nutritious and good food but not award winning or noteworthy. 🙂 It’s okay. I can be honest with myself and others. I never let my guests go hungry but the foods and desserts I make never get too many comments EXCEPT my Mounds Bars. People actually ask me to make these, ask me if I made these, ask for extras to take home, and ask for the recipe! The recipe came from somewhere years and years ago, but I have changed and tweaked it to my own liking. Finally, I have found the “perfect” Mounds Bar. Through the years when others have asked for the recipe, I have passed it on as I had written it down but not as I actually make it. I just never changed the recipe card to what I actually do! 🙂 It is time to pass to my friends my “real” recipe! Mix these well and press into 9×12 pan. Bake for 10 min in pre-warmed oven 350. Should be “stuck together” and only slightly browned. Top with milk chocolate chips. Spread as they melt. I use nearly a whole bag! 🙂 Cool and cut. You can freeze these and they are just as good when you pull them out! 🙂 Do put wax paper between the layers as they separate easier. Enjoy and may you get as comments as I do for this easy recipe!